PAWHUSKA, OK – More than a quarter century ago, through the leadership of Joseph H. Williams, the dream of many Oklahomans to see a significant piece of the iconic tallgrass prairie in Osage County permanently conserved finally became a reality. 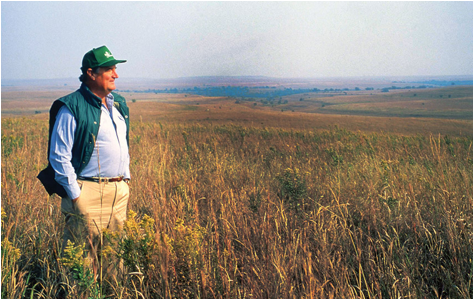 Known as the Tallgrass Prairie Preserve, The Nature Conservancy renamed the preserve in honor of Mr. Williams today at a dedication ceremony. Mr. Williams’ efforts began because he was an avid bird hunter but found game populations were being depleted by changes in rural land use. In the late 1980s, he and other hunters began to explore ways to conserve these native habitats. The effort took an entire organization and a group of visionary Oklahomans to do what others had been unable to do. Chief among them was Mr. Williams who galvanized this amazing group at a time when the local economy was anything but favorable to finding millions of dollars in donations, even for a project that would create a long overdue prairie preserve for the world to embrace. It was a short but consequential meeting in an airplane hangar in Oklahoma City where the Oklahoma trustees through Mr. Williams’ urging and leadership made the decision that forever changed the world of prairie conservation, a decision that asked us all to think bigger than we had in the past. “The Conservancy recognized how vital a large expanse of tallgrass prairie under its protection would be as a symbol to others trying to establish conservation of scale sufficient to make a difference,” said Williams. The initial Oklahoma Board of Trustees led a $15 million campaign and pulled together public sentiment for the project from all over the state and nation. Today the Tallgrass Prairie Preserve – now at 40,000 acres – is the largest protected remnant of tallgrass prairie in the world and home to 2,500 free-range bison. “We thank Joe for his hard work to create something so special. The ideas, inspiration and collaboration that the preserve has exported over the decades is living proof of his legacy,” said Fuhr. In retirement, Mr. Williams lives in South Carolina, remains an avid outdoorsman and naturalist, and continues to support numerous conservation projects in Oklahoma and the Carolinas.